Are you planning on Grilling Plums? 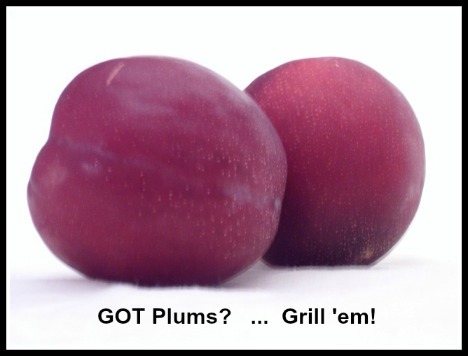 Grilled plums make great summertime snacks and desserts! Including plums in the main menu of grilled dinners, especially paired with grilled pork or sausage is always a treat that livens up the flavour, and the colour! Grilled plums served with ice cream or sorbet will be sure to take the taste buds for a ride! Surprise your family and guests with tasty, healthy fruit prepared on your barbeque! Seize the opportunity of grilling plums when they are "in season" in the area in which you live. Plums that have ripened naturally (on the tree), will not only provide the best texture for grilling the fruit, but will also prove to be the best in flavour. Ensure the plums are ripe, but not over ripe and mushy. When grilling fruits, keep in mind that fruits with a naturally high sugar content can go from "golden brown" to too dark or burnt in a very short time. Always keep a close watch over grilling fruit, never leaving the fruit unattended while grilling for the short time it takes to perfect the barbequing process. Be sure to scroll down for fabulous recipes using grilled plums! Cut the plums in half, and remove the pit. Peeling the plums is optional. Apply a coating of oil, for example canola oil or grape seed oil to the plum halves. Grill plums, cut sides down, until grill marked, about 2 - 3 minutes. Turn, and grill about 2 more minutes until plums are softened and thoroughly warmed. 1. Melt 1/2 cup apricot preserves mixed with 2 tbsp. of canola oil, and stir until well combined. Brush over the plum halves and grill as directed above. ~ For a special treat, add feta cheese to the centres of the peaches and heat until the cheese is warm, or serve with a dollop of Greek-style yogurt. 2. Melt 2 tbsp. butter with 2 tsp. brown sugar and 1/8 tsp. cinnamon (or to taste). Refillable oil spray bottles similar to the one pictured below are great kitchen aids for use when grilling fruit, adding oil to a leafy green salad, and more!